2008.11.25 - I have to wait the spring to collect textures, but i dont stop making the models. I think, the release date will be april, 2009. I work on the track, when I can, but I can't do it every time. This track is on the streets of Budapest, some of the streets have already seen F1 cars, but there was no race held here yet. There will be a normally and an extremely detailed one. The normal track is what we got used to. 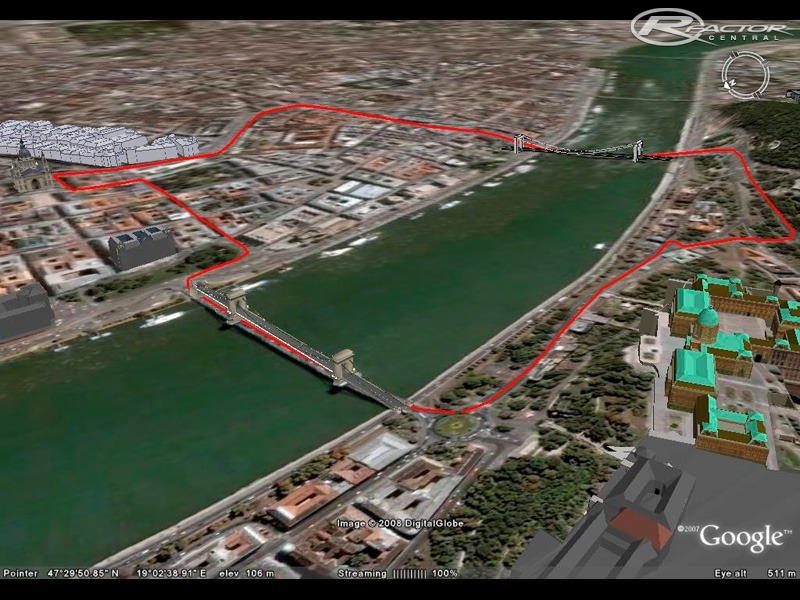 The extreme track will contain things like full 3D trees, 3D grass, potholes:D (who lives in Budapest will understand it:D), 3D spectators on trackside, 3D tyre walls wich moves bin case of collision, etc. Of course it has it's system requirements, but I promice it will look better than a track from F1 CE on PS3. I have to design some unreal building in order to make the track possible to race on it. On Deák Ferenc square, there will be a pit building, which I intend to design in a historic style. I will place also some grandstands, just for the feeling of a real race track. Attention! If someone wants to place an advertisement next to the track, just write me (rafacz/@/freemail/dot/hu), and donate! with a full throttle turn. Then comes two almost 90° right-turn with a short straight. Then you go down and a little left, then you arrive to the slowest point of the track: a right-left chicane. Then a long straight brings you to the Clark Ádám sq. where a roundabout makes you to turn right to the Chain bridge. Then there is a lot of 90° turns. On Roosevelt sq. right, left, a moderate straight, left, right, Basilica, right, Elizabeth square, a fast left turn (ca.45°), and the finish line on Deák Ferenc square. This is my track:). If someone could give me plans, drawings of the buildings on the path, I'd be very pleasured. Thank you. How's the track coming? Still working on it? I wait for this track, because I have lived there for 13 years. I hope it will be ready soon. I think it would be funny to have 2 versions. One is a race track and the other is with trafic like every day, the streets full of cars. Vovovo, ez nagyon király! Mindigis szerettem volna a Budai alsó rakparton száguldozni. Ha elkészül, tuti beiktatjuk a WTCC naptárba. Kitartást hozzá! kb mikorra készülsz el vele? Looks like it could be an aewsome circuit, good luck and hope you finish it!